Despite FIFA 19 packing in licenses from all over the globe, each year sees fans clamour for the addition of leagues that aren’t already in the game – with the Chinese Super League newly included last time out. But until now we’ve never seen the governing body of one of said leagues join supporters in clamouring to be included in EA’s football series. England’s Vanarama National League is changing that with its campaign to make it into FIFA 20. 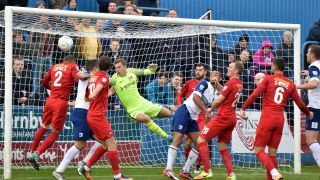 Home to many former league clubs such as Wrexham, Leyton Orient, and Jeff 'Soccer Saturday' Stelling’s beloved Hartlepool United, from a gaming standpoint playing in the fifth tier of English football has always been limited to management sims. League sponsor Vanarama hopes to end that tradition with backing from FA chairman David Bernstein, an online petition which you can sign here, and a mock-up of a ‘National League edition’ box for FIFA 20. They’ve even got a player or two in on the act, such as Sutton United captain Jamie Collins. He started out at Watford and has spent 16 years on the outskirts of the pro game at clubs such as Newport County and Aldershot Town, yet never appeared in the FIFA series due to non-league teams being shunned. “I’d love it if our fans were able to play as me and help me nod in the winner against Man City at Wembley,” says Collins. “The campaign is a great idea – it’s about time real football got in the game." Collins is one of the players on that mock-up cover, alongside Havant & Waterlooville top scorer Alfie Rutherford. "This campaign, when successful, will make a real commercial difference to the financial challenges facing non-league football – in addition to putting a smile on the faces of some of the most devoted fans in the world," says Bernstein. GamesRadar+ has reached out to EA Canada for comment and will update this story if and when it arrives. FIFA 19 is out now. Looking for some wise investments as Team Of The Season time approaches? Then immediately venture over to our FIFA 19 TOTW guide.